“Queen of the Campus.” Saturday Evening Post. February 4, 1956. 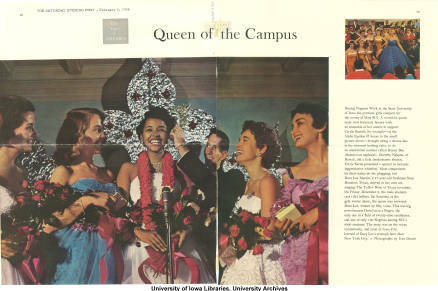 In the winter of 1955, 17-year-old Dora Lee Martin won the title Miss State University of Iowa (as the UI was then called). While winning this contest, based on female nominations and male votes, was uncommon enough for a freshman, Martin’s status as the first African American student to be awarded such an honor gained media attention all over Iowa, across the country and around the world. Stories appeared in The Des Moines Register, The Saturday Evening Post, and The Star in London, among many, many other outlets. In these clips, Dora Martin Berry looks back on her time at the University of Iowa, discussing her experience of winning the Miss S. U. I. contest, and her experiences as an African American co-ed in the 1950s. Her memories prove an invaluable testimony of the times from which she came and the university’s social history. In this first clip, Berry discusses her first impressions upon arriving in Iowa City from her hometown of Houston, Texas. In this clip Berry talks about the strong black community she found in her classmates at the University during her campaign for Miss SUI. Here Berry talks about her expectations during the contest and her reaction to hearing that she had in fact, won. In her closing remarks, Berry explains what winning Miss S.U.I. meant to her, while imparting wisdom she has learned in her life since. Listen to the full interview here, conducted in 1997 as part of the African American Women at Iowa Digital Collection and the Iowa Women’s Archives.